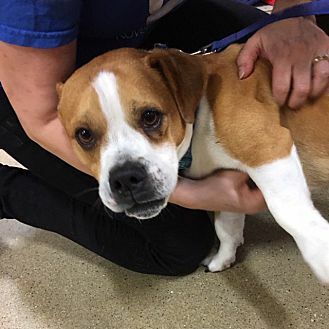 FRANK (FRANKIE) is a mix of Bulldog / Boxer and Basset Hound (we think! 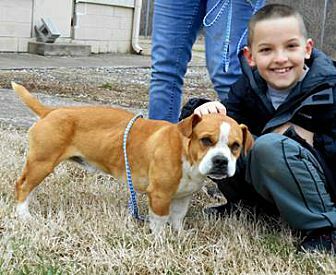 ), he is approximately 9 to 12 months of age, and weighs 25 lbs. Frankie loves all people and dogs. In only a few days of arriving at his new foster home, he has already learned his name! Frankie is a very friendly little boy ... always wagging and always smiling, and those short basset legs make him as cute as can be! Frankie was very shy at first when he arrived off the transport from southern Indiana where he had been staying briefly at a kill shelter. We think he might have been a stray that was picked up off the street because he was very thin with ribs showing through. Our first stop was at a pet shop where he was very timid at first, but as families started strolling in, Frankie was a magnet to them, rolling on the floor with the little kids, and trying hard to impress their moms and dads by climbing up on top of a stack of dog food bags so they would really notice him! What a character! 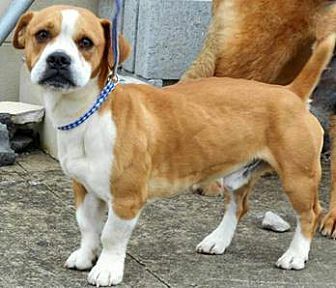 Frankie became quick friends with all the other dogs in his new foster home, all various breeds and sizes. Even the "crankiest" of the house dogs immediately fell in love with Frankie! He is a great catcher of treats and toys and his favorite seems to be bouncing tennis balls, which he can catch on the high bounce and trot around so proud of his efforts! Frankie curls up in a dog bed or in an open crate during the day for naps, eats twice a day and is putting on the added pounds he needs. He also likes to play with Nylabones and soft toys. Frankie was not completely potty trained when he arrived, but he is improving day by day which is a good sign, with my years of experience, that he will be a success in that category. He goes into his crate on his own at bed time and sleeps quietly all night long. Frankie is neutered, up-to-date on his vaccinations, is micro-chipped and comes with free micro-chip registration. His adoption fee is $225 (cash or check). For more information on Frankie and our adoption process, contact his foster mom Margrit at 630-820-1584.